This entry was posted on March 26, 2018 by ILOVEACEITE. 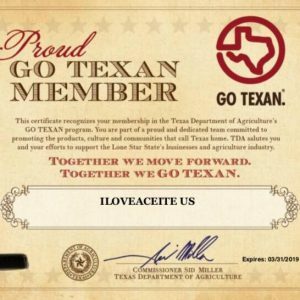 After more than two hard work years, we´re so happy because our company headquartered in San Antonio, ILOVEACEITE US become a new proud GO TEXAN member. The Texas Department of Agriculture’s (TDA) high-profile GO TEXAN marketing program generates widespread awareness among consumers searching for products grown, produced, processed or manufactured in the Lone Star State. With its signature mark in the shape of Texas, GO TEXAN is truly a symbol of Texas pride. 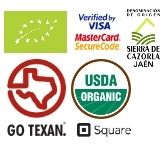 GO TEXAN is a tremendous program that serves businesses throughout the great state of Texas. Extra virgin: why is it the best choice? How to taste olive oils? Warehouse : 1331 N Pine St.